The prize-giving ceremony of Bashundhara Industrial Baby Diaper Winter Offer was held at Bashundhara Industrial Headquarters on Saturday. Mahaboob Morshed Hasan, chief adviser to Bashundhara Group Chairman Ahmed Akbar Sobhan, attended the event as the chief guest. Winners of three-month Winter Offer campaign received prizes, including LCD TV, microwave oven, gold ornament, diamond ring and mobile phone, at the simple ceremony. Mahaboob Morshed Hasan handed over the prizes to the winners. 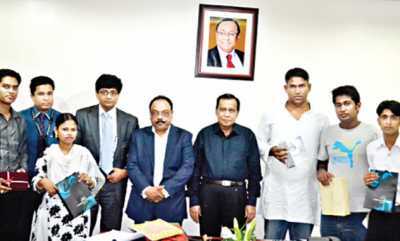 Senior Deputy Managing Director of Bashundhara Group Belayet Hossain, Head of Division of Paper and Hygiene Products Mujibur Rahman and Deputy General Manager (Accounts and Finance) of Paper Sector Mirza Mujahidul Islam were present on the occasion.